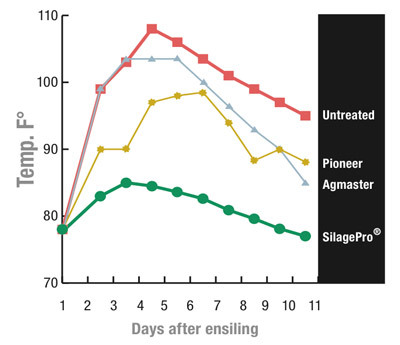 SilagePro® was first formulated as an enzyme product to produce an environment where forages would ferment faster and cooler utilizing natural bacteria. Somewhat variable results indicated that natural bacteria alone are not sufficient to provide consistent results. 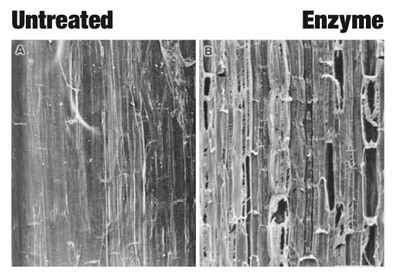 Consequently, four strains of lactic acid producing bacteria were added to the enzyme mixture to provide robust lactic acid production matched to the resulting enzyme activity. All silages experience heating and microbial activity that result in a loss of energy, starch, digestible protein and dry matter. Good management practices help reduce losses but do not eliminate them. 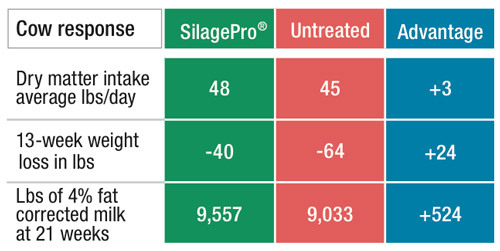 SilagePro® alters the fermentation – pH drop is accelerated, less heat is produced, fermentation takes days, not weeks and fiber digestibility is increased – dramatic differences that can be measured by forage analysis and animal response! A fast, cool fermentation yields more silage at feedout. SilagePro®’s enzyme group releases sugars and “breaks fiber bonds”, opening the fiber and increasing surface area for digestive bacteria. This increases the rate of fiber digestion and improves NDF digestibility. 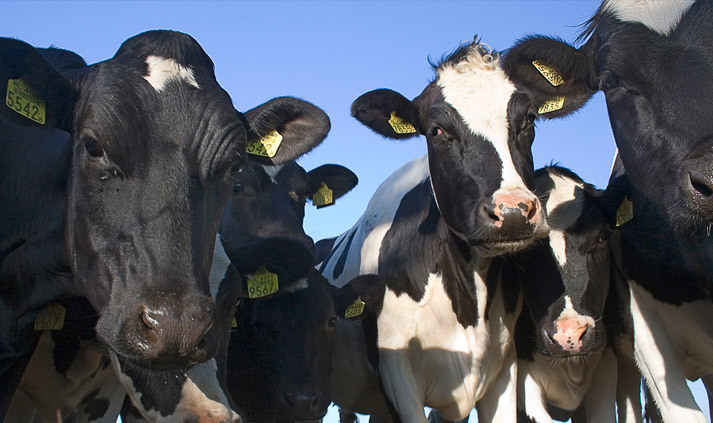 Two-year study evaluating intake, weight loss and milk production. To achieve maximum shelf life, granular SilagePro® should be stored in a cool and dry place out of direct sunlight. SilagePro® concentrate should be kept in the refrigerator or freezer.